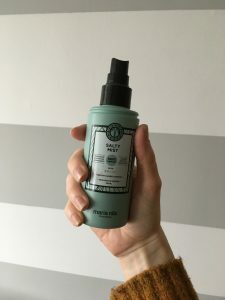 I’ve had the opinion that all sea salt/beach sprays are the same! Mostly because how I usually use them is to just create a bit of texture in hair that I’ve either blowdried or prepped for an Upstyle. Its a handy product to create a bit of grit or take the silky soft feeling off hair. Lately, I’ve been really loving that gorgeous beachy laid back hair you see on Pinterest and pin repeatedly dreaming of hotter climates and Mojitos! So I’ve been styling my hair this way recently and drinking G&T’s for effect… its been going well!!! 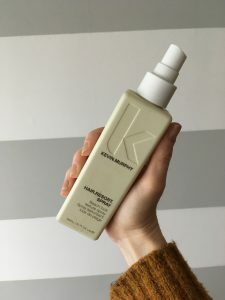 Love the Kevin Murphy Products although I don’t know them well enough – must do more research! PACKAGING : Really nice, interesting, simple design as with all Kevin Murphy products. SMELL. : So important as I’m a bit headachey! This has a nice light smell that definitely brings on those summer holiday feels! RESULT : Creates a nice beachy texture straight away and doesn’t wet the hair so much that it undoes all the curl you spent an hour doing! Not sticky so I could continue to tweak my hair a bit after I’d sprayed it. Felt some of my hair was left a little hard after it dried but if I gave it a little rub with my fingers I could soften it up easily. I don’t have to wash my hair every day so I like to get a few days out of it. I felt my hair was a bit tangled the next day. I wouldn’t recommend brushing your hair with a beachy wave ( or like, ever!) so I like to just restyle my hair with my hands each morning. This was a bit tricky on day two so think a bit less product on the initial application may have given my style more longevity. FINAL WORDS : Lovely product, does what its supposed to do. Use sparingly if you need it to last a few days. Fun fact: You pronounce ‘OUAI’ – ‘WAY’. 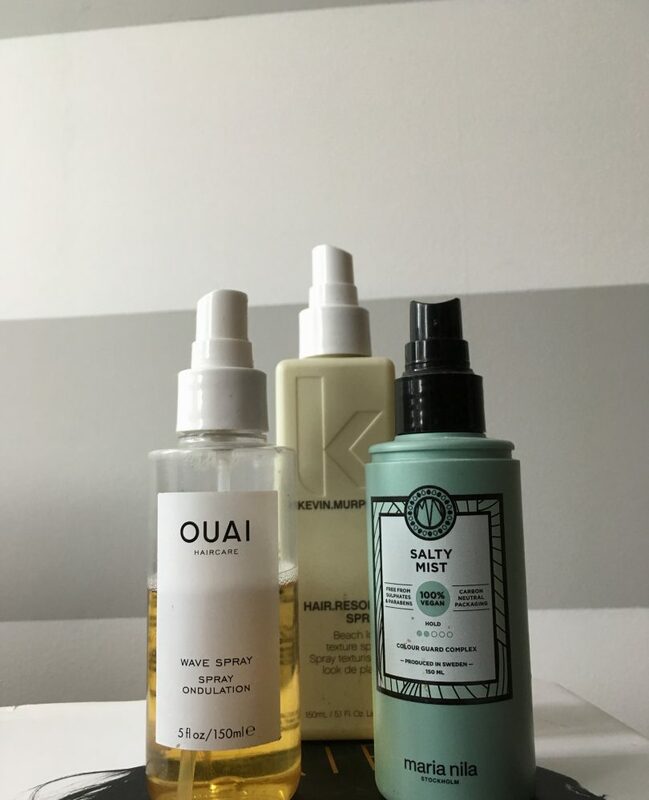 A range of hair products by celeb hair stylist Jen Atkin, not available in Ireland as far as I know but you can order on ASOS. 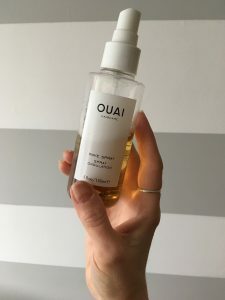 SMELL : Bit too perfumed for me but doesn’t linger too long so for my own hair I didn’t mind it, wouldn’t choose it for working with a lot of clients in a row. RESULT. : Creates a really great beachy texture and because of the fine mist doesn’t soak the hair undoing all your styling. Doesn’t go hard as it dries, so is beachy but soft. Lasted well and restyled easily on day 2… and 3… and if I’m honest 4!!! Extra bonus points – Maria Nila products are 100% vegan & cruelty free, sulphate & paraben free. PACKAGING : Really nice colour and design. The matt plastic feels nice in your hand! BOTTLE FUCTION : Didn’t spray well every time so found it a bit tricky but when it did spray it was a nice even mist. RESULT : Gives a good beachy feel as you’d expect but felt I’d need more of this one to get the result. It was nice and soft and didn’t leave my hair too crunchy which I liked. FINAL WORDS : Definitely a contender in the beachy contest but there was something about the way this sprayed that I didn’t love. I think it was the function more than the product I didn’t like so much.